India’s many styles of popular, folk and classical dances are as rich and colourful as the country itself. Bollywood dance is probably the most popular dance associated with India thanks to the popularity of Bollywood films, not only in India but also abroad. These prolonged and energetic dance sequences are a vital ingredient of any Bollywood flick – along with a good dose of melodrama and a few fight scenes! So what makes a dance classical? There are eight Indian dance-styles which are classified as ‘classical’ because they all have their roots in the Natyashastra, a classical treatise on the arts believed to have been written in Sanskrit by Bharata Muni sometime between 200BC and 200AD. This text covers several aspects relating to drama, dance and music. It covers the facial expressions, hand gestures, head and eye movements, and some of the body positions and movements which are common to the classical dance styles. Many of the classical dances were traditionally performed in temples as a sacred offering to the gods by resident dancers. Today classical dance is performed on stage, most often by solo dancers, though group compositions and innovations in dance choreography are also very popular. All classical dances have two distinctive elements: nritta or pure dance which is abstract dance movements, and the facial expressions (abhinaya) and hand gestures (hastas) of its expressive dance element, or nritya. It takes several years of rigorous training to learn and master any of these Indian classical dance traditions. There are four classical dances having their roots in South India: Kathakali and Mohiniattam from the state of Kerala, Bharata Natyam from Tamil Nadu, and Kuchipudi from Andhra Pradesh. 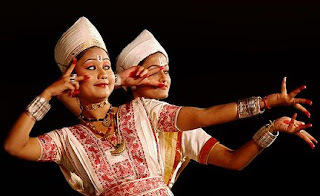 In North India we find the origins of Kathak, Odissi from the state of Orissa, Manipuri from the north-eastern state of Manipur, and Sattriya from north-eastern Assam. 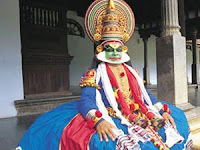 Traditionally performed only by men, Kathakali from Kerala literally means ‘story-dance’. Performances include several dancers enacting scenes and different characters from Hindu mythology, especially the Ramayana and Mahabharata. This ‘larger-than-life’ art form features bright billowing costumes, colourful make-up, exaggerated expressions and frenetic music which is played by accompanying drummers. Kerala’s other classical dance, Mohiniattam, is a graceful and alluring dance performed by women, most often solo. The movements are soft and graceful, characterised by gliding movements. The torso moves in circular figure-8 movements with the legs kept in a half-bent (demi-plié) position. The footwork is rhythmical and energetic, keeping time with the music. Mohiniattam dancers are always dressed in beautiful white and gold costumes. Originating more than 2000 years ago in the south-eastern state of Tamil Nadu, Bharata Natyam is one of the most popular Indian classical dance styles, performed by both male and female dancers. The quick, rhythmical footwork is mathematical in its precision, while symmetrical, geometrical patterns and lines are drawn by the intricate arm and leg movements, and dramatic poses. Like Mohiniattam and Kuchipudi, a distinctive feature of the dance is its basic posture in the half-sitting or demi-plié position. The classical dance of the state of Andhra Pradesh, Kuchipudi, is similar in many ways to Bharata Natyam with its rhythmical footwork and quicksilver movements. A unique feature of the Kuchipudi style is Tarangam, a technique where the dancer dances on a brass plate while moving it across the stage. 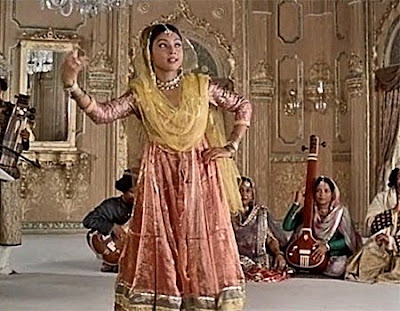 One of the most popular Indian classical dances is Kathak which has three main schools or styles based in the North Indian cities of Lucknow, Banaras (Varanasi) and Jaipur. Kathak is characterised by fast rhythmical footwork set to complex rhythms, and impressive lightning-fast pirouettes finishing in precise, dramatic poses. The rhythm and tempo of the dance is set by the accompanying percussion instrument, the tabla, the sounds of which the dancer’s feet emulate through quick, precise footwork accentuated with the sound of bells tied around the dancer’s ankles. Female dancers wear long flowing ankle-length skirts which twirl and flare out during spins and pirouettes, creating beautiful visual designs. Odissi, the soft and lyrical dance from the eastern state of Orissa can be described as visual poetry! Considered to be linked to the element of water, the gracefulness of the arm and wrist movements, and fluid movements of the torso resembling waves on the ocean, are juxtaposed with firm rhythmical footwork and striking poses. The characteristic postures of this classical dance are the tribanghi, where the body is ‘bent’ in three places (head, waist and hip) and chawk, a quadrangular posture created by the knees bent outwards and outstretched arms forming a square. The love poems of the Gita Govinda describing the love between Radha and Lord Krishna, are a favourite theme of expressive pieces performed in the Odissi style. From the mountainous region of Manipur on the north-eastern border of India, comes the graceful feminine dance called Manipuri. With delicate steps and gentle undulating movements, Manipuri dancers sway to the music while moving their arms in slow circles and arcs. The continuous flowing movements and curving of the body into different postures give this dance form a suppleness and fluidity which contrasts with the quick, sharp movements and strong footwork of the classical dances of South India. Like its movements, facial expressions are also soft and subtle. 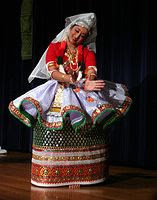 Manipuri dancers wear long, embroidered skirts along with translucent veils. Male Manipuri dancers play on a drum known as pung while executing exciting leaps and turns set to a fast rhythm. Sattriya originated in the north-eastern Indian state of Assam, where this classical dance has been performed for centuries as a spiritual ritual in monasteries by male monks. Today the dance is a performing art also performed by women in solo and group performances. 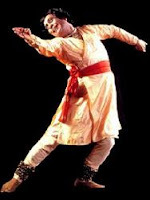 Though centuries old, Sattriya was officially recognised as a classical dance of India only a few years ago. The repertoire of this classical dance is vast, accompanied by traditional music from Assam which includes a drum called khol, cymbals, flute, violin as well as other instruments. Dancers wear distinctive Assamese costumes and ornaments. This article was published in two parts in the April and May 2008 issues of Rangoli. If I hadn't read this blog, I wouldn't have known to look up the Manipuri and Sattriya dances on youtube. I have seen many of the others, but each beauty is wonderful. Thank you. Nice blog there are good information about classical dance .Thanks for share this information. 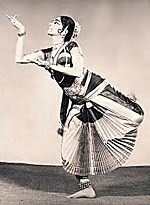 The information about Kuchipudi, though accurate, is completely lacking and does not explain what Kuchipudi really is. It is misleading. Please give a better more detailed description. Thank you to everyone who has left a comment here. I'm glad you enjoy this blog, Anonymous. 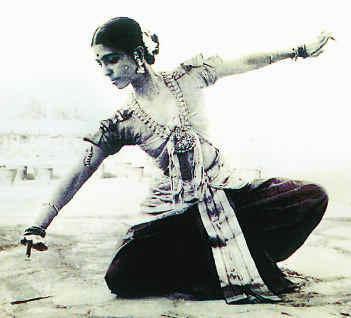 I liked the blog regarding Indian Classical Dances is quite informative. Thanks for sharing. Thanks for sharing blog on Indian Classical Dance.